I do not grow pumpkins, but yet after reading The Pumpkin Plan by Mike Michaelowicz, I’ve found myself searching for one. Working as the Garden Conservancy ‘Open Days’ Regional Rep, I have met some clever & talented gardeners, landscape architects and designers – and seen some amazing works of landscape art – large and small. On this year’s Fall tour one designer -Jack Lamm – blew it out of the patch! 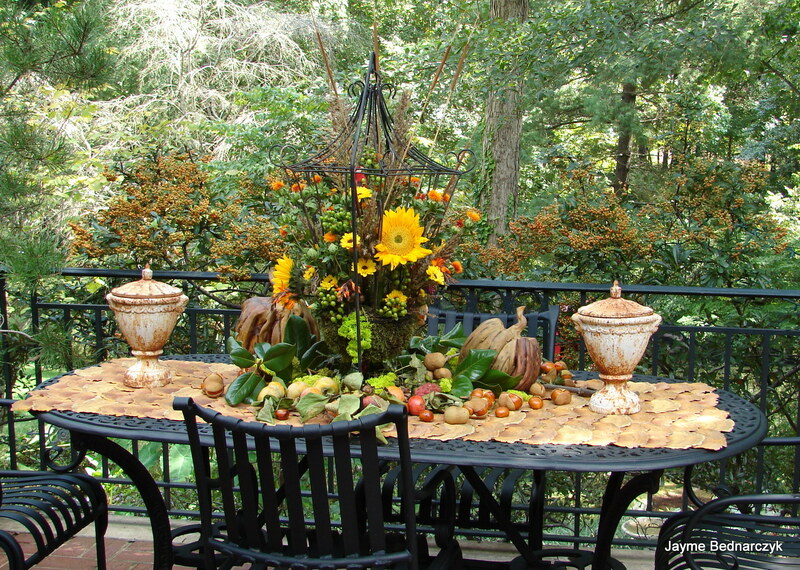 Oh the whimsy, the mixture of winter squashes – pumpkins, gourds, grapevines, mosses, caladiums and yes, Cotton… a textural transformation on a traditional Southern porch… A welcoming WOW! With restrained elegance, one could ponder this porch for a long time and not see all the detail of Jacks delightful diorama of seasonal fruits, topiary & frogs… looking effortless, yet those pumpkins are defying gravity! Perhaps someday I will hire a Jack to help me do my own magical display of seasonal splendor, but until then I am grateful to the Homeowners for the opportunities to enjoy their porches and delight in their gracious Quarry Hill Garden. 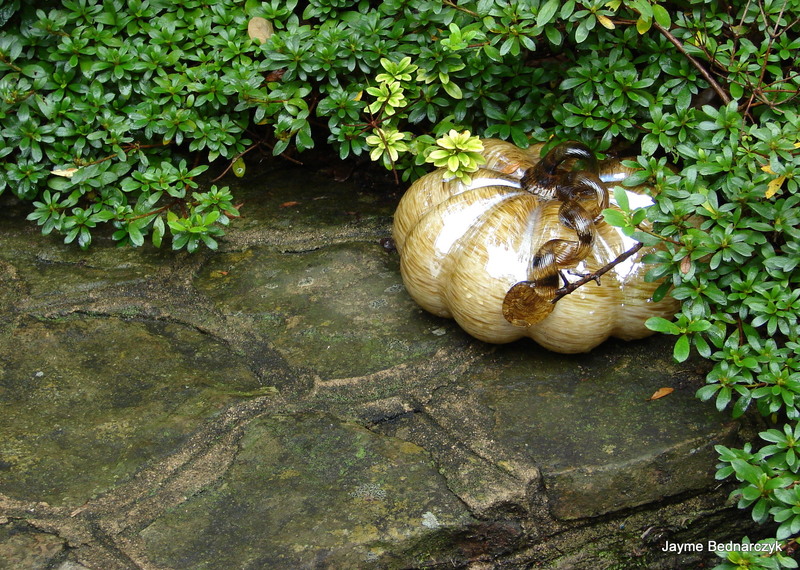 A glass pumpkin on the stone stair, demurely tucked under a ground cover… heart be still. So simple, so clever, so understated… This I could do this! 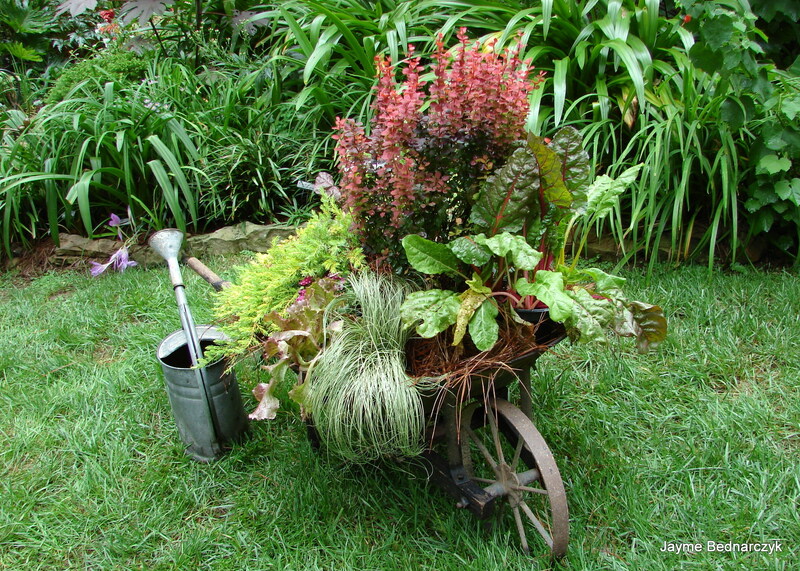 Jack’s Berberis ‘Orange Rocket’ which he had tucked into a wheelbarrow with an clever texture combination of swiss chard – stems color echoing the barberry- & Carex- was also “a must have” to color echo the most expensive Echinacea Sombrero ‘Hot Coral’ at my hacienda muy caliente garden. 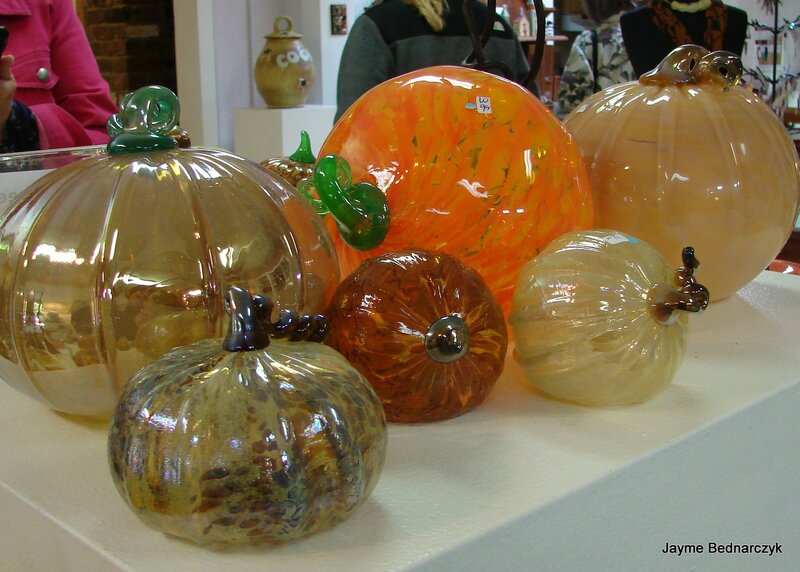 That night while searching online for glass pumpkin, it was evident that a trend has emerged with glass blowers nationwide – exquisite pumpkins! Oh did they have Pumpkins…. 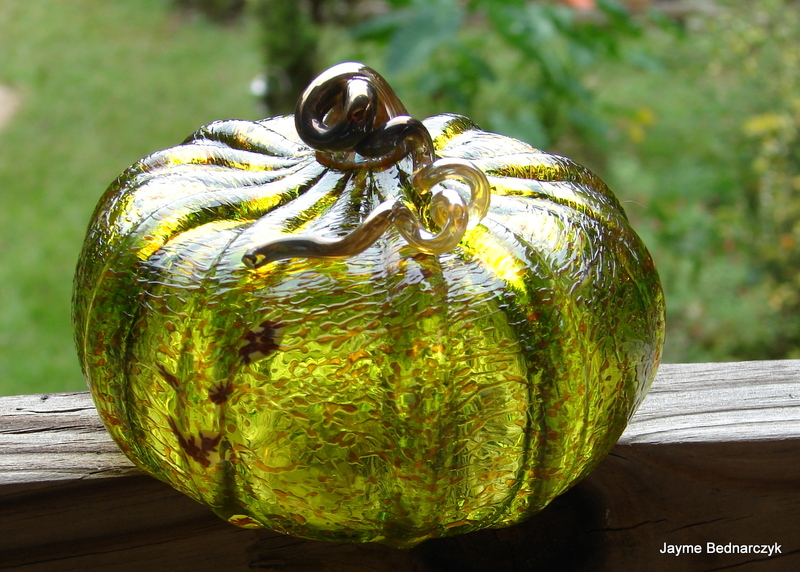 So this season, I have found inspiration from Jack the Pumpkin King; I have found a glass pumpkin – a diminutive beauty by glass blower Lisa Oakley; and am happier than Cinderella – as it is impolite to have your glass slipper on the table – but until I find that perfect place in the garden to tuck this treasure away as a delightful surprise… and ode to a job well done and Jack’s inspiration… it will be part of a seasonal table décor. 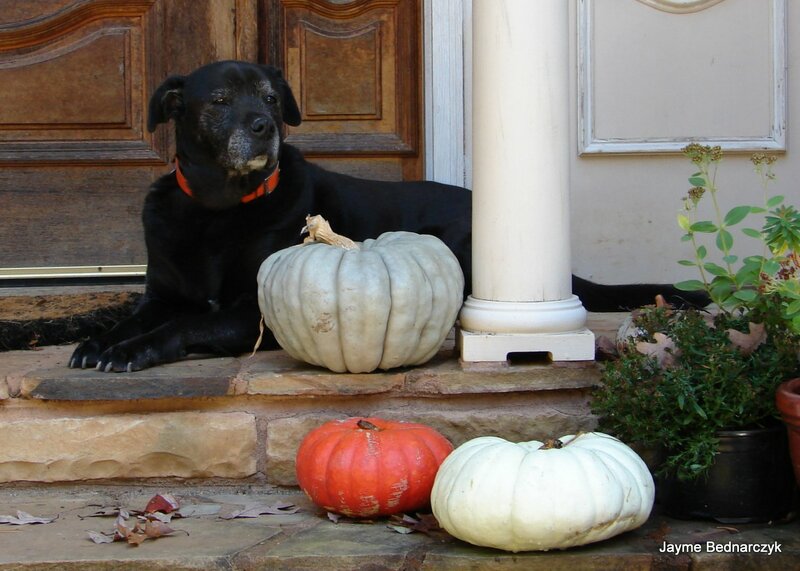 I am grateful for Mary Charles for suggesting the Pumpkin Plan, a pumpkin quest, and our loyal pumpkin-eating pooch who inspires me to think it’s never to late to teach an old dog a new trick. 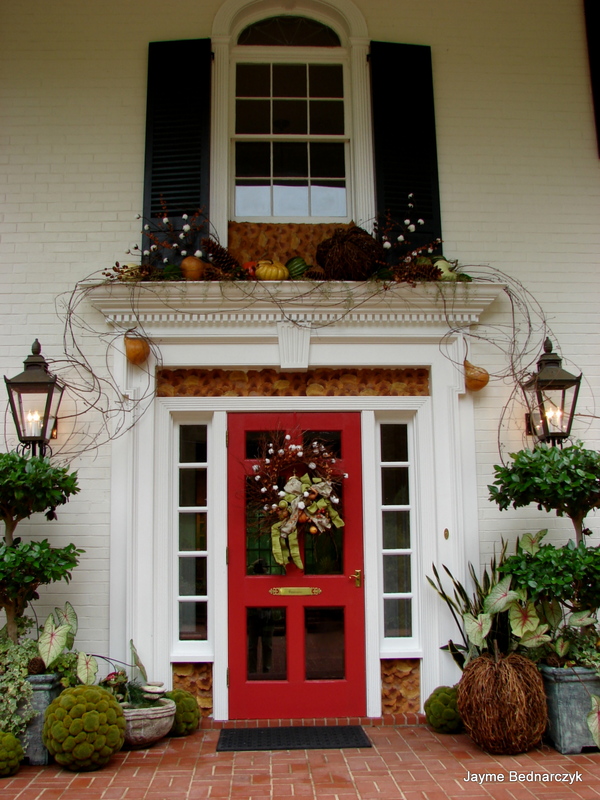 This entry was posted in color, Entwined Gardens, Garden, Garden Conservancy, Landscape, Uncategorized and tagged Cinderella, Garden Conservancy, Gardens, Glass, Halloween, Jack, Jack-o'-lantern, Photo, plants, Pumpkin, Thanksgiving. Jack Lamm is a creative designer and very knowledgeable about plants, plant care and horticulture , and a great eye for composition! Thanks Linda! I look forward to see what he will create next!